I then went on to repeat the exercise in 2012 (which is available exclusively from Amazon.com, Amazon.co.uk, and other Amazon countries) and in 2013 (which is available exclusively from Amazon.com, Amazon.co.uk, and other Amazon countries). Wednesday 1st May: prompt: to write a Drabble (a 100-word story) – How the Drabble came about (100 words). Thursday 2nd May: prompt: use a picture from http://www.flickr.com/explore – The Quarrymen (second-person story) (303 words). Friday 3rd May: prompt: character-led – It’s Not You, It’s Me (279 words). Saturday 4th May: prompt: an obituary – R.I.P. Lenny ‘Shades’ Froug (544 words). Sunday 5th May: prompt: inspiration from Wikipedia – The Thing and the Nameless Page (834 words). Monday 6th May: prompt: untravelled location – Sally never listened (588 words). Tuesday 7th May: prompt: first person point of view – Quiet and noisy (812 words). Wednesday 8th May: prompt: second-person pov – The last thing you think about (330 words). Thursday 9th May: prompt: third person limited – What cost a human life? (226 words). Saturday 11th May: prompt: submission piece – Dating Paradise (60 words). Sunday 12th May: prompt: set at a wedding – Making up the numbers (162 words). Monday 13th May: prompt:write the story of Sam Chase, who has a mysterious past and an uncertain future – A win-win all round (310 words). Tuesday 14th May: prompt: finish a story that starts, “On the edge of the mountain, silhouetted against the setting sun, there is a small ramshackle cottage made of wood.” – The Ramshackle Writer (412 words). Wednesday 15th May: prompt: write a story based on the song title, “Beyond The Blue Horizon”. – Beyond The Blue Horizon (a sci-fi story!) (770 words). Thursday 16th May: prompt: Future (Im)Perfect — What if [hot button issue you care about] has [come to pass/been squelched]. 10 years from now, what does the world look like? – Progress (409 words). Friday 17th May: prompt: speed – Worth every penny (147 words). Saturday 18th May: prompt: bubble – Bubble and squeak (169 words). Sunday 19th May: prompt: Jamie stood in the wreckage of his ransacked house, trying to take it all in – Wreckage (432 words). Monday 20th May: prompt: 16-year-old antagonist – Before Jessica (253 words). Tuesday 21st May: prompt: fragile protagonist – Leaving a gap (984 words). Wednesday 22nd May: prompt: Natalie, missing dog, gun, running water – Human Unfriendly (295 words). Thursday 23rd May: prompt: picture of dog and chewed cat toy – It Wasn’t Me (831 words). Friday 24th May: prompt: a resolved noise – Scratch, squeak, bark (140 words). Saturday 25th May: prompt: start with the ending and work backwards – All-inclusive package (558 words). Sunday 26th May: prompt: official, corpulent, totem, panic, scratching, delicious – His job depended on it (100 words). Monday 27th May: prompt: holidays – Eight a year (145 words). Tuesday 28th May: prompt: children, good and bad – Billy No Mates (300 words). Wednesday 29th May: prompt: thwarted character – Talking when we could be walking (654 words). Thursday 30th May: prompt: the non-memoir – Petrified (1,250 words). Friday 31st May: prompt: when one door closes – Plenty more fish (724 words). 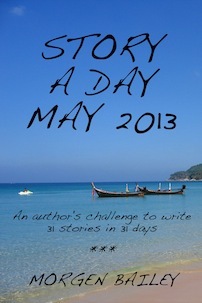 now it’s all over I’ll keep going by writing a story a day for the 5PM Fiction slot. You can sign up to receive these blog posts daily or weekly so you don’t miss anything. You can contact me and find me on the internet, view my Books (including my debut novel The Serial Dater’s Shopping List, a writer’s block workbook, and various short story collections) and I also have a blog creation / maintenance service especially for, but not limited to, writers. If you like this blog, you can help me keep it running by donating and choose an optional free eBook.